Aqua = 5th Chakra = Listening, Speaking and Integrating intuitive information with divine information. 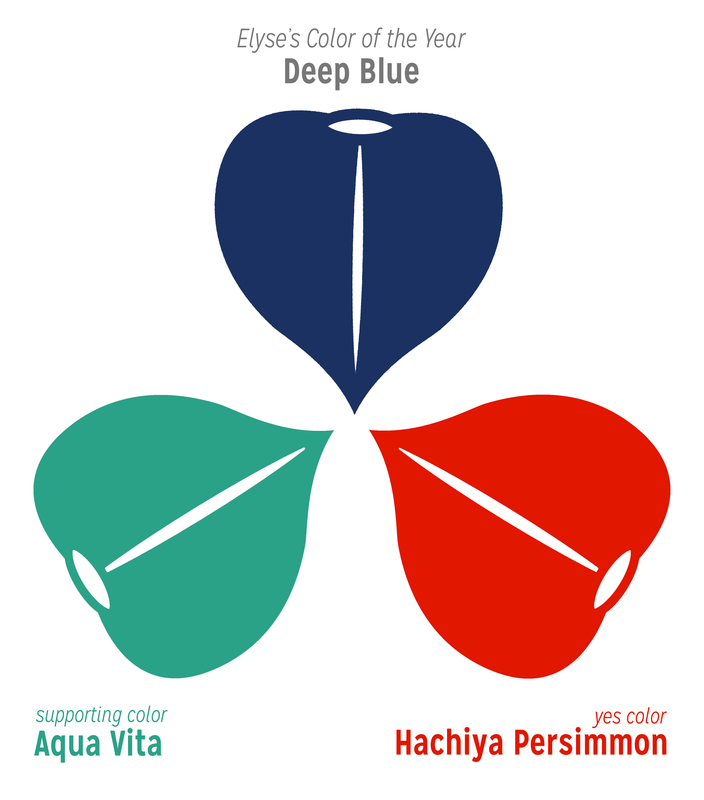 Non-Aqua Blues = 7th chakra = clarity, cosmic connection and wisdom. When blue shows up, it’s a good thing. It’s the road back from pain, from misunderstanding, from blundering around in the dark. When blue shows up, you’re in for a year of answers. I love this color. I love it. It’s the color of clear language. The color of saying exactly what you mean. In heaven, the sky is this color. You know when you’re with someone, and everything is understood, and you don’t need to say anything, because they already know? That’s the power of this color. It’s the ability to say one thing that says everything else. 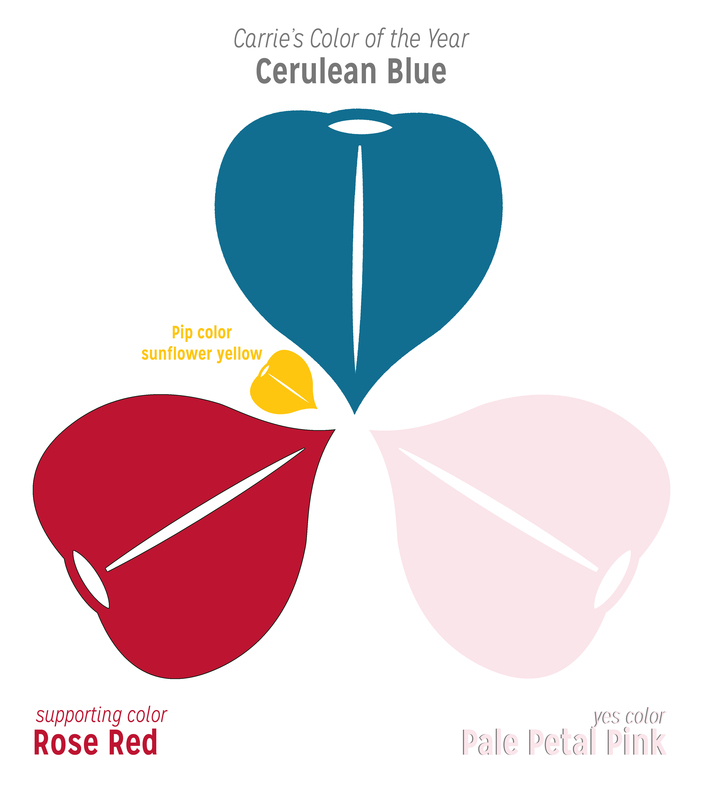 To add to your year of glorious communication, your support color is Rose Red. This color means shared passion. Wear this when you’re raring to put your passions out there. Your yes color is Pale Petal Pink. This pink is to temper all that putting-it-out-there. It’s the color of gentle intuitive listening. And you need a pip, an extra supportive color- It’s Sunflower Yellow. This is the color that supports you when you channel power through your being. It’s not just your own power, it’s the collective power of all-that-is. Have a great year, Carrie! I had a similar color last year. Turquoise means Healing Words; using language to heal yourself and others. I love that you have this color. I found last year to be very helpful, and most of it, I found myself talking to myself. It was good. So, when you find yourself working through the words, whether you’re doing it for yourself or for others, know that you are on the right path. 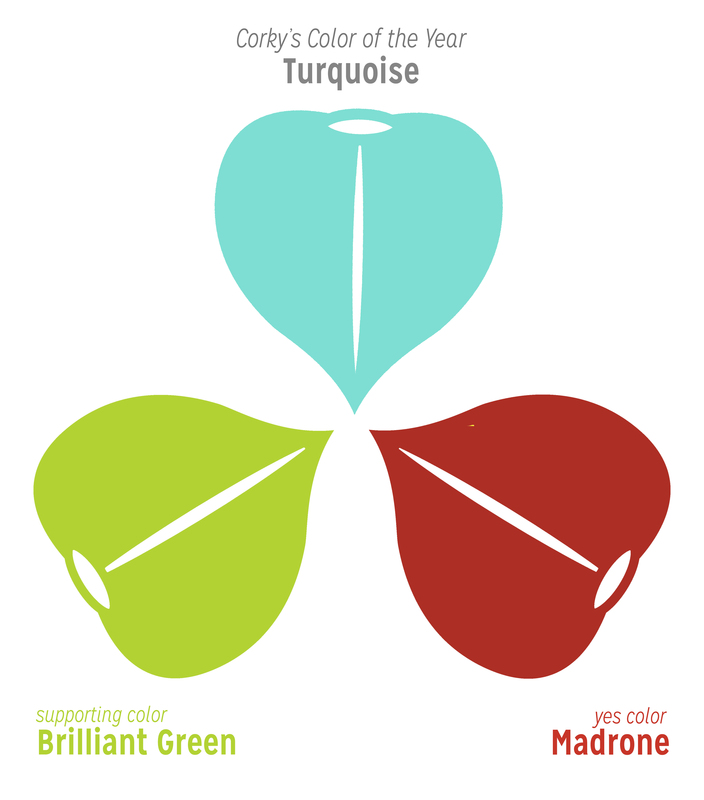 To support you- I give you Brilliant Green. Wear this color when you want to gather and share your emotional intelligence. Your yes color is Madrone. Madrone means Fertile Ground. It’s so gorgeous. When you see this color, you’ll know you’re on the right path. I noodled on yours for quite some time, before realized I was seeing the sky at day and night. This sky blue with a little bit of green, it’s the color of sky, especially in the Caribbean. Sky Blue means Clarity. That extra touch of green that you saw, that’s a nod to the heart. This is the year when you’ll experience clarity in your heart. To support you, I give you Pale Apricot. Wear it when you want to experience deep intimacy. And, the night sky, it’s showing up as your Yes color. The color is technically known Summer Night and it means Magic. Ah! I can’t wait to see what your year brings to you! You, too had two colors! This blue-grey literally means Limitless. It made me laugh when I saw that your word was Limitless! This color has the clarity of Sky Blue coupled with the speed and grace of Silver. It’s quick clarity and grace. 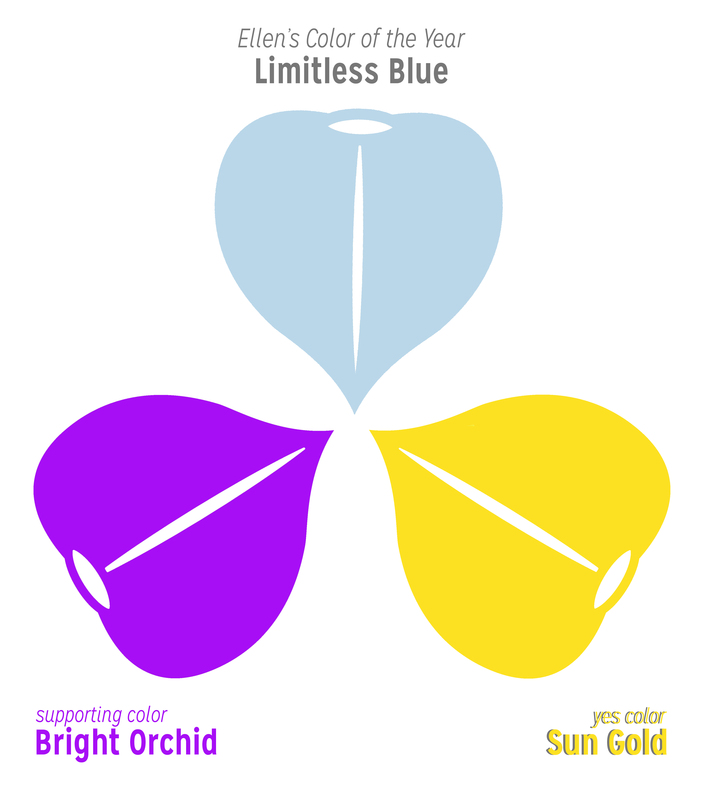 To support you, I give you Bright Orchid. Bright Orchid is a pinky-purple. It’s All-sight- seeing through the eyes of all that is. Use it when you want extra insight into universal wisdom. And your yes color- it’s Sun Gold– a bright yellow that speaks to power and happy self-confidence. When you see it, remember the sunshine in your life, and channel it into your day! Your blue is deep and tinted with purple. This means wisdom touched with divine mercy. You’ll learn a lot this year, and with it, you’ll feel a sense of mercy and compassion. To support you, I give you Aqua Vita. I saw this color as your support color. It’s a new color to me, which is all about clarity and heart’s comfort. It’s a gorgeous light blue-green. This is a soothing watery color that you should wear when you want to feel clear and comforted. 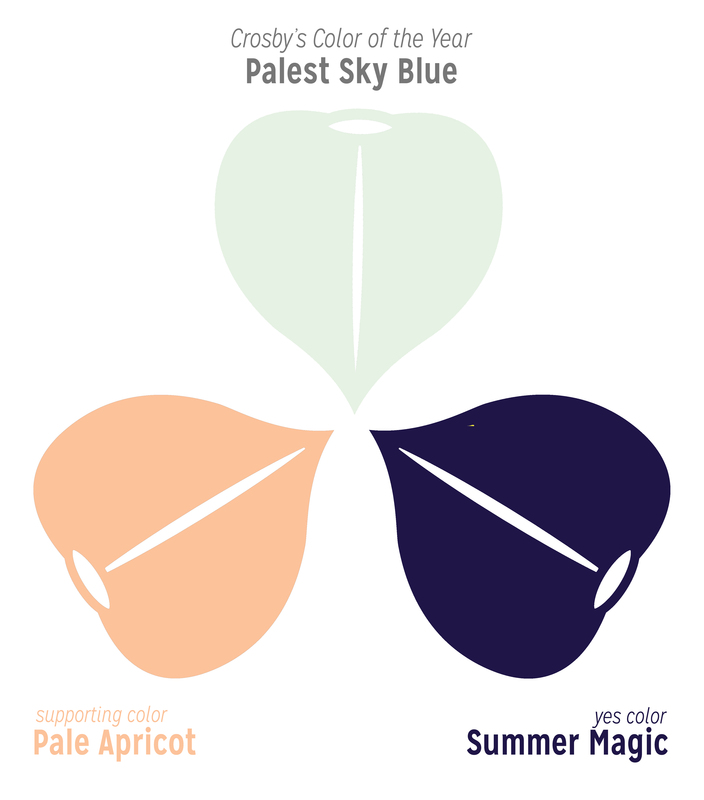 Your yes color- it’s Hachiya Persimmon which means creativity, strength and divine support/ interaction. I hope you have a beautiful year! Sky blue means clarity. It’s a year of everything becoming crystal clear in your life. Sure, of course, that means that there will be doors closing and other doors opening. It means that choices will need to be made. But- you’ll have clarity which means a good chance of good things to come! To support you- I give you Midnight- which means A Conduit of Wisdom. Wear this deep inky blue when you want to feel wise. And your yes color- Temeraire Rose. Temeraire means Reckless. When you see this rosey-pink, feel free to abandon propriety, tune into your intuition and go with your gut. Kira, I hope 2016 brings you great joy. Gorgeous bright Lapis! This color is here to support you while you travel. And even if you’re just going around the sun, you’re going to feel things moving smoothly. It’s a year of flow, of moving through it. It’s going to feel good. To support you on this year-long journey, I give you Blaze Orange. Blaze Orange means Live Your Purpose. Wear it to be reminded of what you’re here to do. And your yes color- it’s Zinnia– the 3rd chakra supporter, the color of new ideas. When you see it, expect your imagination to spark and crackle! Lana- safe journeys- good times- that’s what I hope for you! I’ve been wearing a lot of midnight, because I need to be wise these days. You’re going to have a year of gaining wisdom, and of being a conduit of wisdom for others. To support you, I saw Wild Green. Wild Green is the color of the wild heart. It’s loving without worrying about the consequences. It’s answering the call of the wild with your heart. Wear it when you need to cut loose. And, you have the same Yes color that I have- Aspen Yellow, which means I will spring up. When you see this color, you’ll know that your power is coming back to you! Have a great year- Laurel! This Larimar stone is known as the tranquility of sea and sky. This color reminds me of Ellen’s color, which is about limitlessness. So, yes- tranquility and limitlessness and solitude is in store for you this year. Your palette is one that doesn’t really go together, but that’s okay. Just imagine that these colors belong in different rooms of the same house. So, to support you, I saw Oxblood, which means deep personal strength. It’s a grounding color, a color that helps you feel safe and secure. Wear it to remind yourself of your strength and wisdom. And your yes color- It’s Ocean. 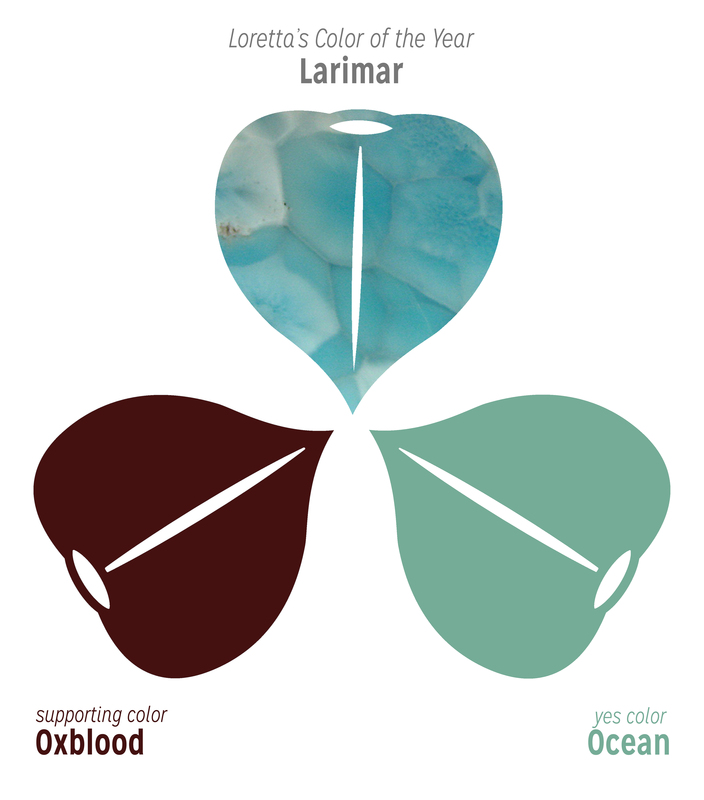 Ocean is 4th and 5th chakra support. Ocean means A Journey of the Heart. When you see it, just know that you’re on the journey and more is going to be revealed to you. Loretta- this is going to be a good year. I know it! Mindy, you also have turquoise as your color. In fact, your and Corky’s colors were so similar that I had to compare them side by side in facebook. Yours has a little bit less purple/grey to it. Anyway, this color means Healing Words, experiencing and using language to heal yourself and those around you. I see your work this year deepening as you bring more language to your healing and supportive experiences. And even though you and Corky received nearly the same colors of the year, your support and yes colors are so different from each other. Your support color is Berry. It’s a vibrant, juicy red-pink. It’s the combination of 1st chakra inner wisdom and 6th chakra intuition (usually 6th chakra observes outward). It holds the inner and outer in balance, and also speaks to the short-term nature of ripening, and the awareness needed for perfect timing. Wear Berry when you want to balance and move forward. I feel like this is the color that Shepherdesses wear, the color for herding and nurturing and moving along many varied capricious things at once. Your Yes color is Pale Apricot. It’s the color of Deep Intimacy. I’m wondering if you’ll find it in nature where you live. When you see it, you’ll know that you’re staying connected with those you love, even when life is busy. Much love to you, Mindy! Sweetie- you had to wait the longest for your colors this year! I know your other colors are going to make up for the wait! So, your Light Aqua means: Speak with love, listen with love. Consider your heart before you open your mouth. In light of the work you do, and who you are, I think this comes naturally to you. Perhaps this points to a year where you will have a lot of opportunity to further hone this skill. Also, I can’t help but think that the world needs your voice more than it is currently experiencing it! Your support color this year is Bright Lime. Wear it when you need to remind yourself to be open to the love around you, and to be in the moment with love. And your yes color- it’s Guazabira Granite. When you see it, you’ll be reminded that there’s solid ground beneath you, and that at any moment you can tap into the earth’s deep and powerful energy. I can’t wait to see how your year turns out! And that’s all of the Colors of the Year! Last year i understand my color and i want happy with the words…limitlessness, tranquility, and especially solitude. However, last year held an amazing journey for me that i believe will continue for the rest of my life. It was a journey of religious reawakening. Discovering a peace and strength (oxblood) within myself. I can now be alone but not lonely, rely on myself without feeling abandoned, and my heart is full with the blessings in my life. What i thought was going to be a journey of infinite loneliness has turned in to an understanding of happiness. I’m so glad that i have the chance to participate in the color of the year and know such amazing people as yourself. HURRAH! I am so happy for you Loretta! SO HAPPY FOR YOU!